Thanks to my best friend and travel agent Ms. Kelli Black, I just booked a trip to Paris and London for the month of February. Just a week long, 3 days in each city, but I can not wait! Having never been to either city, it's time to start making my list of places to go and things to see. 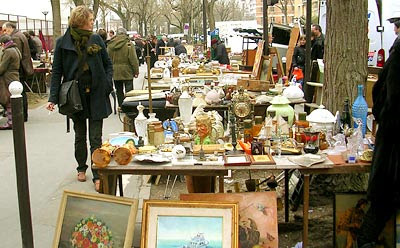 So far at the top of my list is some sort of flea market in Paris and Les Miserables in London. No way!! Have a blast and I can't wait to hear about everything! have a lovely time! paris and london are both amazing. here are some things i'd recommend for each city. london: london is my favorite city in the whole world. lots to see. you won't get to do everything so enjoy as much as you can. and most of all, eat lots of chocolate. galaxy is my fav. you will be glad you did! eat some fish and chips and indian food. go to the tate modern, and of course the touristy places since it's your first time... there are lots of beautiful parks, st. james park is a fav, and so many museums and fun little shops. brick lane is great for that and harrods and harvey nic's are fun to go in too. paris: walk the champs elysees, go to the musee d'orsay, louvre, and rodin museum. if you have time, the picasso museum. go up the eiffel tower and there are a few ways to get up: by stairs or by elevator. take the elevator. i took the stairs and well... take the elevator. eat lots of pastries, french onion soup, etc.